There was a long time since the last update of Brothers in Games. The recent release of BIG T3 is part of a general redesign. I wanted to keep the features available before touching the core app. Brothers in Games have also been rebooted. First, it is now a Android 4-only app. Sorry for the users of old devices (in the Android way :/ ) but when the decision was made, most of the users where using a Jelly Bean or above version of Android. This allows me to avoid all the mess about compatibility and provide the last features offered by Android. The evolution of Brothers in Games in its V2 is still at a preview stage. The purpose of this release is to let you discover the new features and be able to provide some feedback. 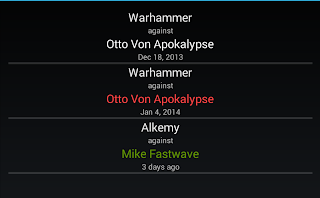 The Table Top Tournament overview is now part of a dedicated app. I have previously explained the motivations. You still have a button to access to this feature, if you haven't installed the app, it invite you to get it from the Play Store. If you have installed the app, it will open it. Game type. This can be a Game System such as Warmachine, Warhammer Battle, but not only. If you want to keep track of your chess or tennis records, it is up to you. Date. Of course you want to remember when you've played that game. Opponent. This is who you've played with. Result. 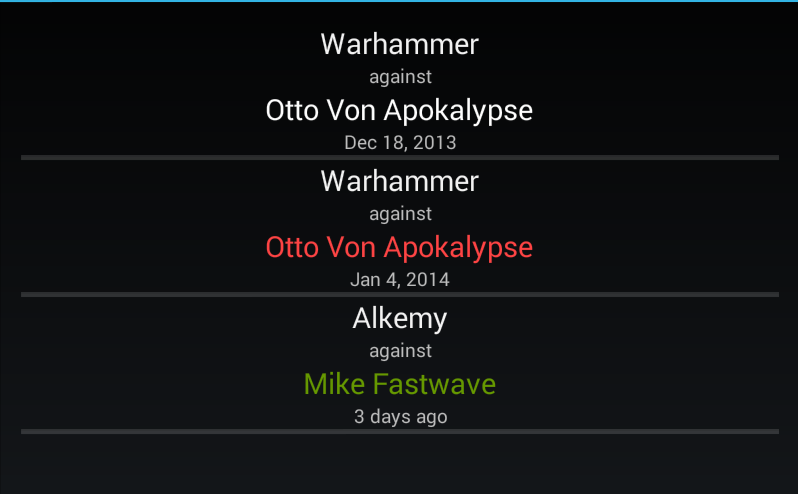 Once again, as a general purpose app, this field will only remember if you lost, win or ended in a draw. I think that the most important idea is to keep track if you win or loose against a single opponent. The draw by itself will mean anything else. Notes. I know that those basic data are not enough for most of us. This field is meant to keep track of any other information. Your opponents are people, not just names. You may want to call them for another game. So, you want to record their name, phone number, e-mail address... On a device, the best place to keep this kind of information is in your contact app among your other contacts. I think that this is the best rather than duplicate the informations. 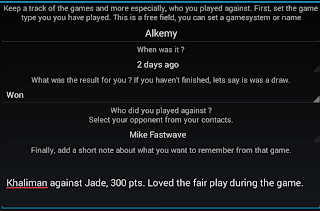 The feature is not available yet because I am not decided bout where to set the action, but from an opponent, you'll be able to open its contact informations on the native app so you'll can contact him the way you want. When you click on the add opponent button, the app will ask your native contact app to display a list of contacts so you can choose one. 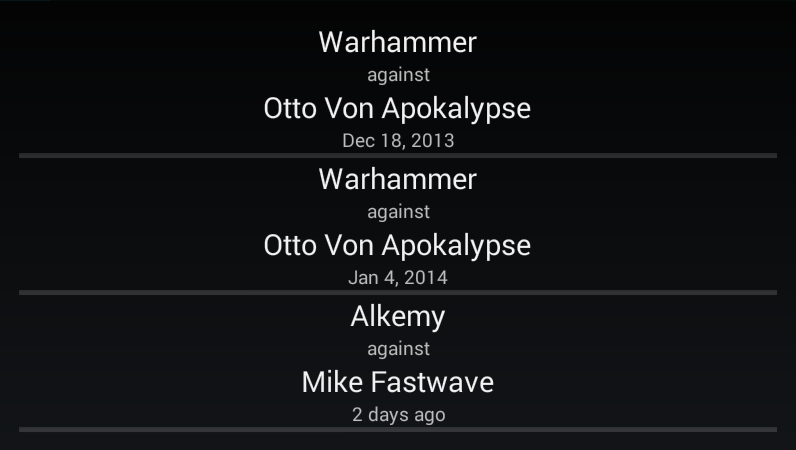 This list is displayed by your native contact app, Brothers In Games is not aware of who is displayed. When you select a contact, the native app will sent Brothers In Games a contact ID. That is how it works on Android. Brothers in Games will then query your contacts for the contact with that ID, but not for all the informations about this contact. The only data Brother In Games is asking for is a contact ID and a name (those are 3 fields: first name, last name and a Display Name which is a kind of formatting in Android). Brothers in Games will store in its database those 4 fields (contact ID, first name, last name and Display Name) and does not access any other information. Your contact informations stored in the database are left on your device and are not sent to us in any way. Brothers in Games displays 2 main informations: the list of your games, where you can add a new game, and a list of your Brothers. The list of your Brothers is build from the data of your games. 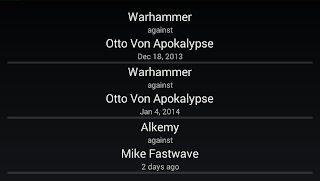 For now, it is a convenient way to see who you have played with and what was the last game and when. A sample of the My Brothers view. The My Games view lists all the games you've played. This is a simple listing displaying the basic information of your game. The details will be displayed on a detailed view which is still not available. As I stated, this is a first preview. There are a lot of feature missing. For now and for this preview, all the data you are providing are not displayed. The game result and the notes are still missing. Don't worry, they are stored and will be displayed in the next update. As you can add a game, you can't edit or delete it. This feature belongs in a selection or detailed view which is still not activated. So is the contact access. I wanted to publish this preview soon enough so you can see the purpose of this app. You can update it now or get it from Google Play. The missing features will be added soon. In the meantime, you can review the app on Google Play of follow the Google+ page.